I swept up C/2007 F1 LONEOS during the course of my comet hunting before dawn this morning (Oct 15/16th 2007) at 06.13 BST. The comet was very low in the NE morning twilight within Coma Berenices near the Bootes border not far north of Arcturus (which was hidden by obstructions) in bright twilight. It was so low that I reckon any future pre dawn observations from here are numbered. The comet shared the same FOV as a house rooftop and was very impressive despite the hazy sky. The intense central condensation was striking in appearance as a large white disk. The gorgeous green coma was tightly wrapped around the CC and elongated in the direction away from the Sun as it blended with the tail. The coma was compact, very well condensed with sharp edges and was parabolic in shape in the solar direction. The effect of the solar wind on the comet is very obvious visually. A narrow tear drop shaped spine extended from the the coma into the tail and I seen a thin linear extention leaving the coma to the NW - possibly the leading edge of a faint dust tail?. The ion tail itself was a subtle blue colour and extended for 1 degree 10' to the NE, very straight and sporting several fine streamers some of which could be seen fanning out from the coma. 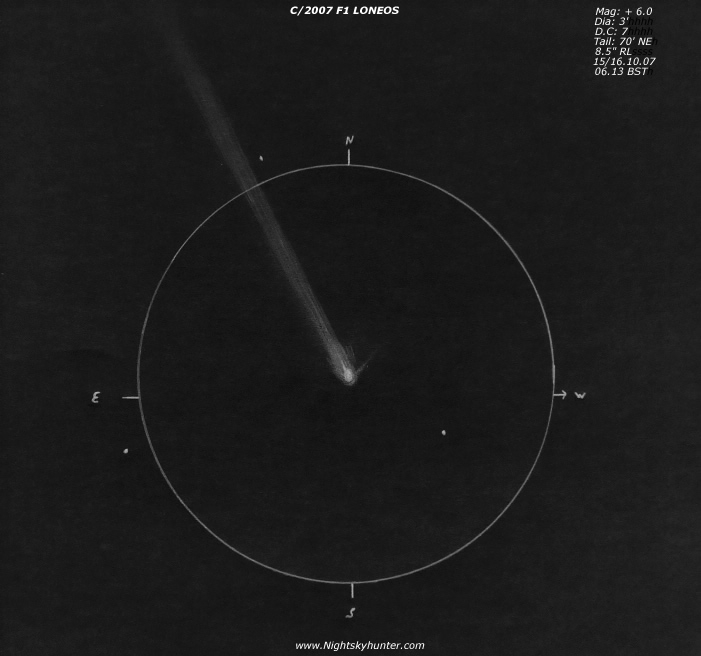 The comet was easy in 10x50s and I seen it several times with the naked eye using averted vision. This is my 5th observation of LONEOS and the 2nd within an 11 hour period so thank goodness for the timely clear skies! Mag: +6.0 Dia: 3' D.C: 7. Sketch made using a 8.5" F/7 reflector with 32mm eyepiece.